Baked Potato. And French Fries. Do you really have to choose one? Nope! Check out this cool video for making Hasselback baked potatos that has all the joy of french fries. This recipe has been around for decades. 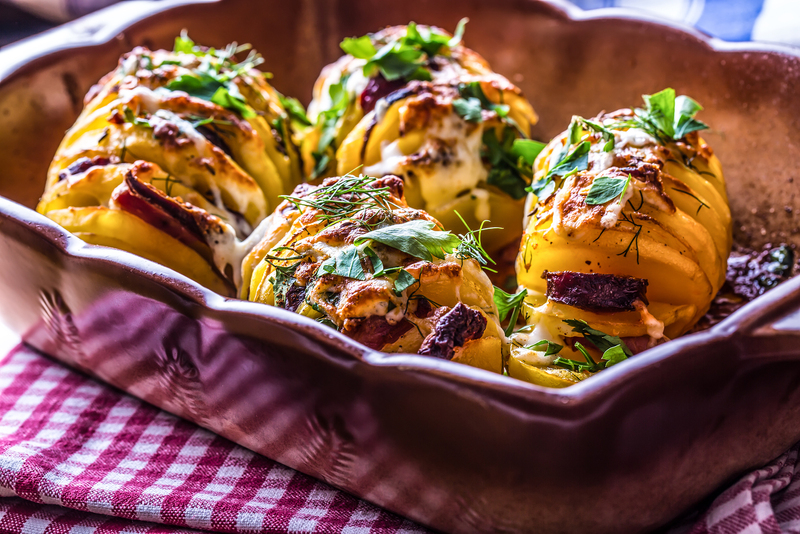 It’s official name is the Hasselback style potato and is sometimes served with sour cream and fresh dill. Personally I like leaving on the skin so I can get more fiber and vitamins. However, if you prefer, you can peel the potato first. You may want to use a thin skinned potato like Yukon Gold or a red skinned potato for more flavor. You can buy smaller potatoes in a variety of colors and slice them up and bake all at once instead of a big potato. The bottom line is you need a really sharp knife. Then you slice thinly almost all the way to the bottom of the potato. Cooking Light suggested putting chopsticks along the side of the potato to act as a guide so you don’t accidentally slice all the way through. Mix up some olive oil with salt, pepper, herbs, and fresh chopped garlic. Then pour or brush over the potato, making sure the oil seeps between slices. Bake, uncovered, at 450° for 45 minutes to an hour, depending on the size and type of potato. Sprinkle with more fresh herbs like parsley. The potato can be your friend when cooking yourself thin. It’s a good hearty side dish. I’ll often bake a potato and stuff it with cheese, broccoli and salsa and call it lunch. I’ll take a small potato and dice it up, and then fry that a little bit before tossing in veggies and an egg for breakfast. Potatoes add a great mouth feel and sense of comfort. If you don’t want to use a potato, look into alternatives like parsnips and celery root. But as I always say, balance is everything.